Jose Luis Soria was a doctor who first met St Josemaría in 1953. He was ordained to the priesthood in 1956 and from then until St Josemaría’s death in 1975 he lived and worked with him in Rome. Fr Soria now exercises his priestly ministry in Canada. You have said that one of St Josemaría’s characteristics was his cheerfulness, and in fact you published a book called “Maestro de buen humor” (Teacher of cheerfulness). How was this characteristic shown? Yes, in the book I explain what I think was one of St Josemaría’s main characteristics. On the one hand his optimistic, smiling attitude to life, which made him such an attractive, positive person to know. That was what can truly be called his cheerfulness, his joyfulness. It was part of his temperament, strengthened by his sincere, radical awareness of the fact that he was a child of God. On the other hand, his ready response to others, with a quip or joke, also showed a highly developed sense of humour, going beyond mere cheerfulness. It was true wit, a rapid capacity for seeing what was incongruous, ambiguous, or indelicate, and responding with an unexpected, amusing twist. St Josemaría was also a teacher in that sense. When you saw him in a relaxed family setting, you would often smile or laugh out loud at his intelligent, affectionate, humorous comments. 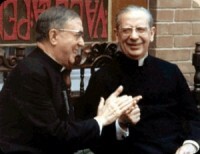 At the same time, St Josemaría had a strong, powerful personality and put things very clearly. Didn’t this sometimes create tension? How did he correct people? It’s true that he had a strong personality, typical of his Aragonese background. He used to say that that was one reason why God chose him to found Opus Dei, because there were so many obstacles to overcome in getting the Work going. And it did give rise to tension, especially if it was someone who didn’t yet know St Josemaría too well, or was of a timid disposition. It’s always painful to be corrected by someone, because it wounds our self-love. But in the twenty-two years I spent with him I can only recall one occasion when he corrected me without good cause. And as soon as he realized the facts, he begged my pardon and showed me his usual affection, with deeds. Was it pleasant living with him? It’s sometimes said to be hard living with a saint – what would you say? St Josemaría himself used to say the same sort of thing, when he warned us that we – including himself – should avoid the situation where ‘to put up with one saint, it takes two saints’. I have always understood that to mean that if someone thinks they’re a saint they are hard to live with, because they make their opinions or points of view almost into dogmas of faith. That never happened with St Josemaría. Firstly, because his sanctity – and hence his humility and charity – were absolutely genuine. The Magisterium of the Church has confirmed that fact with its own supreme, definitive testimony, although St Josemaría himself always said he was just ‘a sinner who loves Jesus Christ’. And secondly, because he exercised great love for everyone’s personal freedom, and never imposed things on others as dogmas. And when he realized he was wrong about something, he said so, and he ardently defended the freedom of everyone in Opus Dei. The fact is that cheerfulness is not only compatible with charity but can be one of the best ways of practising it. Among the charismas that God granted St Josemaría was one that might go unnoticed by people who never met him: he could lead people to God up the gentle, steady slope of cheerfulness and good humour. In The Way he wrote that ‘True virtue is not sad or gloomy, but pleasantly cheerful.’ That’s the way he always tried to live. That meant it was great living with him, even though there were times when his tiredness or sickness made itself felt in family life. Such times could be hard, but we all knew that they were like single reefs in a great ocean of affection, peace and joy. How did he react to objectively difficult things: slander, unfaithfulness to Jesus Christ, or the sickness or death of someone he loved? And what about little ordinary, everyday setbacks? Normally you couldn’t tell that those things affected him at all – things like machines breaking down, power-cuts, personal medical problems, all that. But I think that what looked like him not reacting was actually the result of a supernatural process that included accepting God’s will, fortitude in putting up with discomfort, and detachment from what contributed to his personal convenience, among other things. 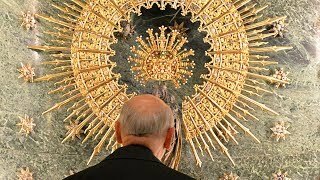 He realized that these things were ‘passive mortifications’, and he accepted them willingly, out of a desire to sanctify little and ordinary things, which is very much part of the spirit of Opus Dei. It was different if the difficulty involved a lack of responsibility, carelessness, laziness, etc. on the part of someone he knew. Most often he reacted, sometimes forcefully, to correct and thus help the person concerned, but he did this not because he had been inconvenienced but because it implied an offence against God, or at least a lack of love for God. What would you like to pass on of your personal experience in Opus Dei, to those who join it in the future? I’d like to tell them to listen carefully to St Josemaría when he impressed on people that they should fulfill the norms that are part of the spiritual plan of life of the faithful of the Prelature. ‘Fulfill the norms for me!’ he would say endlessly. But as his successor Don Alvaro del Portillo used to explain, it’s also necessary not to fall into merely getting them done. We can’t just tick them off on a list of things we have to get through, we can’t be content with fulfilling the right quantity but not caring too much about the quality. St Josemaría said that each norm has to be a real encounter with Jesus Christ, not just a pious act that we do out of obligation, like getting it over with so we can move on to something else. This is my experience: people need to discover the sanctifying value of each of the norms, by doing them faithfully, with a lot of love for God and the greatest possible concentration. I would tell them to do the norms in such a way that the level of their awareness of God’s presence rises with each norm. Like that, and only like that, they will come to be contemplative souls in the middle of the world, as St Josemaría was.